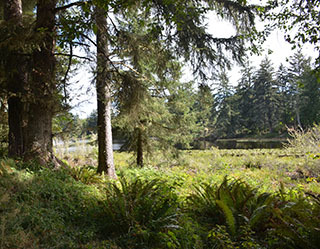 Tucked between Ridge Road and downtown Warrenton, Clear Lake was the last undeveloped interdunal lake on the Warrenton peninsula (outside of Fort Stevens State Park) to be conserved. Sphagnum moss growing on the property, an active bald eagle nest, and a robust population of red-legged frogs were all indications that the ecosystem was in good health. Working with willing landowner Rod Gramson of Warrenton, NCLC negotiated the purchase using mitigation bank funds to offset the impact of filled wetlands elsewhere in Warrenton. NCLC immediately began restoring the site by excavating fill material, removing ditches that had been used to drain wetlands, creating a new wetland, and replanting the wetlands and uplands with native species. Proximity to NCLC’s Gardenia Wetland and Ridge Road Swamp boosts our efforts to maintain and promote wildlife corridors and other kinds of ecological connectivity at the mouth of the Columbia River. Habitat type: Interdunal lake with emerging wetlands, dune ridges, and forest uplands dominated by alder and Sitka spruce.